The lineup for the 2019 New Orleans Jazz & Heritage Festival is out! The 2019 Jazz Fest will be located at the Fair Grounds Race Course in New Orleans, LA over 2 weekends: April 25 – 28 & May 2 – 5. 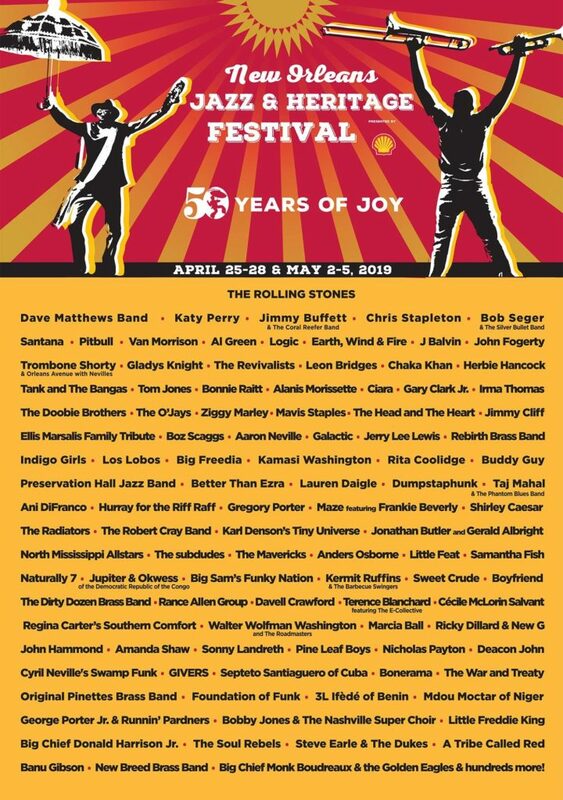 Headliners include The Rolling Stones, Dave Matthews Band, Katy Perry, Jimmy Buffett, Chris Stapleton, Bob Seger, Santana, Pitbull, Van Morrison, Al Green, Logic, Earth, Wind & Fire, J Balvin & TONS MORE! It’s almost overwhelming how many artists are part of this event. And veterans know, there’s more to find outside the festival in the French Quarter and all around NOLA with local and world renowned artists sharing the stage in secret sets. You can go on and plan ahead by checking the daily lineups!